Ángel Sánchez: "Who I am hasn't changed, what changed is my environment and the things I value." From a 'super predator' in the 1990s to a top scholar in 2018, it is hard to imagine a more deserving case for Amendment Four. Ángel Sánchez is lucky to be alive after running with a street gang in his teens. Now he makes his professors proud. In the seven and a half years since he was released from jail, Ángel Sánchez has had plenty of time to dissect what went wrong with his early life, arrested aged 16 after a gang altercation in Miami and sentenced to 30 years in prison for attempted murder with a firearm. His conclusion could be a case study for so-called 'returning citizens,' a term describing the incomplete civil status of ex-felons who have completed their prison sentences yet are unable to vote. He puts it down to the need for love and respect. “I’m a people pleaser. I want to make my peers pleased, so I excel in the company I am in," he says, adding that this applies to when he was in a teenage gang, to his current law school studies. "I look at myself and I ask how much of me has really changed," he said, interviewed at the University of Miami student center complex. "One of the things that I realize has not changed is my desire to want to be accepted, to be loved by my peers, to be elevated and cared for and have people think the best of me. As I simply reflect on that it explains how I got involved in gangs and shootings because that was the environment I was in and that environment respected and valued someone who was willing to fight for his peers, and shoot in retaliation for one of our friends that got shot," he said. "I wanted to be someone people cared for and respected. Coming from a broken home where there was little reason for someone to care and respect me - my mom battled drug addiction and my dad was generations older than me, always working - I never had any other way of earning that. So, I looked for the ways to earn it and unfortunately in the '90s there was a lot of guns and violence so those were the things that I was doing, and in return I was actually getting love and respect," he went on. Sánchez credits his father with pushing him to get an education and proudly sent him his paralegal certificate from prison which he obtained through correspondence courses. His father kept with him until his death, a year before his son was released. “My dad was an instrumental force on me getting an education. But by the time I was a teenager, my peers had more of an influence over me than my dad,” he said. "Now I'm in a different culture"
"People recognized me on the street and I thought I have a place in this world. Now 16-17 years later, after serving 12 years, I came out of prison and I decided I want to go to school and I'm going to do what it takes. I had a lot of roadblocks and I moved into a homeless shelter and I got into the educational system. In that environment people admire and respect people who get good grades, those who produce research, so guess what I ended up doing? I ended up getting 4.0s (grade point average), I ended up getting scholarships, producing research, producing a thesis, co-authoring a law review article before I even got to law school. And now that I'm in law school I'm in the top 5% of my class. What has not changed is the desire to want to be loved and to pursue the things that our culture values. It's just that now I'm in a different culture. So, essentially who I am hasn't changed, what changed is my environment and the things I value." When Sánchez left prison, aged 28, and wrote his first narrative essay for a college course he discussed his need for emotional support. "Some people say that any prisoner can make it in society if he really wants to, but I believe that willingness to make it is only half the story - without the compassionate helping hand of those in a position to help, all the sacrifice in the world would be meaningless. It is when "will" meets "compassion" that success is truly inevitable." In his commencement address at the Valencia College class of 2014 graduation in Orlando, he described himself as an "odds breaker." People like him "come here as long shots and we leave as short bets," he explained. He went on to obtain two degrees at the University of Central Florida before entering law school. Passage of Amendment four would be the fulfillment of part of what he now sees as his mission in life. “The reason that it’s most important to me is because despite the past that I came from, having made so many bad decisions and having overcome so much, I took heed of the message that if you do your time and you do the right thing you will be welcomed back into society," he said. "Having experienced all this, I now go back and speak to at-risk youth, I speak to inmates in prison, sending them a message of hope and redemption. It would be a validation for me that I can look at all my peers as a citizen just like them." 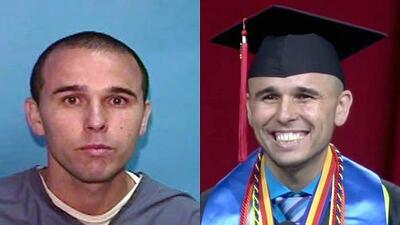 While in prison he created a handbook for inmates about how to further their education. Now in his second year at the University of Miami law school he is among the top five percent of students. When he graduates he plans to practice public interest law. He clerked with a federal judge over the summer and is currently writing a paper for the Harvard Law Review on the prison abolition movement which seeks to reduce or eliminate prisons by relying more on rehabilitation programs. Last month he was invited to speak at Harvard's Department of Philosophy on a panel on " The Challenges of Reentry." He told the audience he was excited to come back to the university for a second time. On the plane he wore the Harvard sweater he purchased on his previous visit and noticed how people smiled at him. "These folk probably think I go to Harvard," he thought to himself. "Because I was wearing that sweater they see me as a good guy, a better person ... I wonder how they would have reacted if they would have seen something that said 'he's a convicted felon, he did 12 years in prision, he shot someone.'"